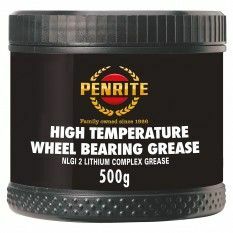 Penrite high temperature wheel bearing grease is a NLGI 2 lithium complex grease for wheel bearings of vehicles fitted with disc brakes, rolling element bearings, plain bearings and general chassis greasing in trucks, cars and agricultural equipment. Ideal for wheel bearings on boat trailers and in industrial applications where water spray, high temperatures or high loads are encountered. Recommended operating temperature range: -10 degrees centigrade to 170 degrees centigrade. Drop point: 275 degrees centigrade.